The charts showed a hunch of unsual occurence and RBI has done it so with a CRR hike . Technically such a reaction should take it to 13500-13800 zone which was being mentioned in previous charts and posts as well as the presentation. Ideally fibonacci supports were around 14k zone which shoud be broken tomorrow. 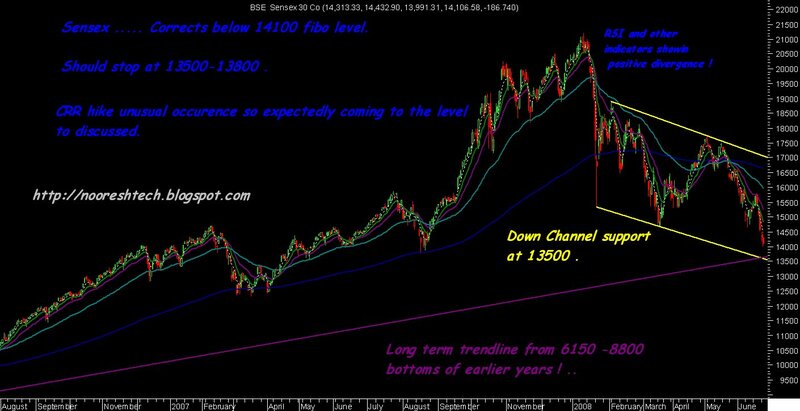 Technically a bounce back is in the offing from such levels and would face resistance at 14700-15000 and 15800 . For quite some it has always been a caution time for traders . Shorts should be covered around the 13500-13800 and traders can go long also in the zone with a short term view. High risk traders can also look for option or future trades for short term . Investors can look to add some quantity close to that levels with a view of bounce back gains or ideally in long term portfolio . As its being suggested to go staggered investors can buy with the next lot of cash at 13500 -13800 but will need patience to see returns . At the current point of time lots of stocks cheaper to Jan levels as even the blue chips are down 35-70 % . But investors need to change focus from the earlier sectors to newer sectors as more the stock cracks more the selling pressure it gets. Stocks which look good to me ... plz do ur own research before taking exposures. RPL has a good support around 155-160 zone and investors can take some exposure arnd 30-50 % closer to those levels. In case it breaks 155 we could see 140 where next 50 % can be added if at all it comes possibilities for the same looks less. 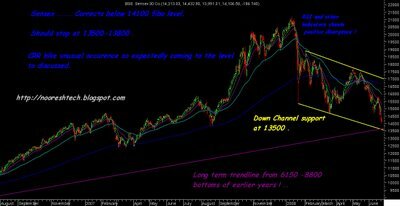 Would prefer to avoid Real estate and engg stocks as technically not able to find supports ! . IDFC and Hindalco could be good bets near to supports. Sesa goa , Aban , K S Oils , Kalpana , Videocon Inds , Karuturi Networks , GVK power could be good choices which could be researched and accumulated on dips around 5-15% from current levels . 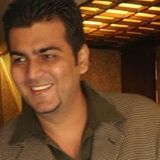 As all the above stocks are from different sectors , mkt caps and fundamentally sound one can make a diversified portfolio by selecting the stocks they like . Do ur own research as this is just a brief view ! . And technically we are in a time wise correction which would last for decent amount of time so investors can slowly accumulate without any hurries .